Clemens Weidmann (éd. 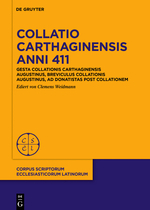 ), Collatio Carthaginensis anni 411: Gesta collationis Carthaginensis Augustinus, Breviculus collationis, Berlin-Boston, 2018. More than 500 bishops were invited to attend a trial in Carthage in 411 that terminated the 100-year-old Donatist schism. The extensive records of the trial, which are largely preserved, provide valuable insight into church history. They are presented here in a critical edition, together with two texts by Augustine that summarize the events of the trial.